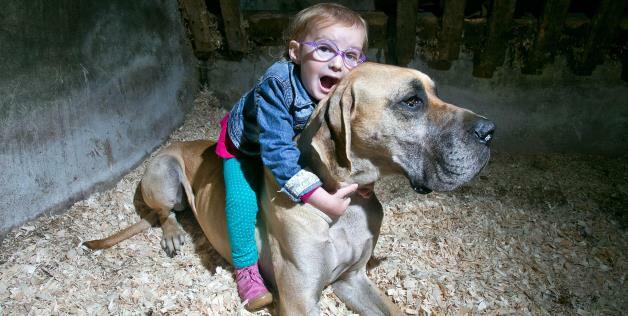 Charlie, a two-year-old Great Dane, has formed a special bond with his family’s three-year-old daughter Brianna Lynch. The young girl suffers from several forms of epileptic seizures, and even though Charlie is not trained as a detection dog he has developed the ability to sense her seizure coming twenty minutes in advance. Charlie and Brianna have a strong bond and both adore each other. Charlie has taken on a role as Brianna’s protector. When he senses one of her seizures coming on he will pin the child against the wall and not leave her side until someone comes to help her. Brianna suffers from four different types of seizures, that all tend to happen at night. She suffers from supplemental frontal lobe seizure, grand mal seizures, petty mal seizures and absent seizures. Twice she has had to be taken to the hospital and be resuscitated. She has gone through eight different types of medicine, but through it all Charlie is there to help.